You may think I'm kidding, but I'm seriously about to go totally sentential! 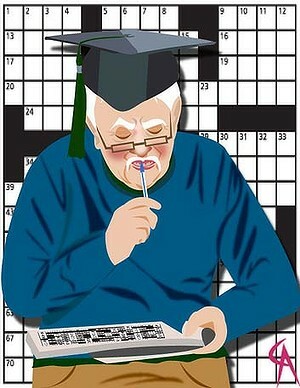 I like crosswords. I really do. Quick or Cryptic, it doesn't matter. I like wrestling with quirky words, linguistic conundrums and whacky morphemes. I have travelled a bit around the globe, and have sat in cafes and trains and transit lounges and hotel rooms and at breakfast tables on many continents and even at my desk at work, and have done lots of crosswords. Lots and lots. And here's my conclusion. The crossword in the Sydney Morning Herald is … the best. I mean it. The best. Whether it's a weekday breakfast or a road trip or a family gathering or a few solitary moments on a Saturday with coffee and croissants, the Herald crossword has given me many hours of pleasure over the years. As proof of this outrageous statement, I'd take a guess that there are a few words in the paragraphs above that gave you cause to scratch your chin and ponder: ''Hmmm? Is that even a word?'' (They're in italics if you missed them). You see, I expect the crossword to use words that the average (admittedly semi-intellectual) Joe would have a decent chance of knowing. At the very least, I'd settle for having heard them maybe just once in my life. But there was one early last week that was nothing less than a full-scale assault of lexicographic nuance the likes of which I have not previously encountered, an onslaught of nonsense of the ilk that ridiculous scrabble apps foist upon us in enthusiastic abandon. Look, I don't want to boast, but the fact is I've got some uni degrees under my belt - diploma, bachelor's, master's and doctorate - and have more letters after my name than are in it. I would think this gives me some kind of intellectual robustness and crossword capability. And I'm old school: I can't help but think that if you need a dictionary, thesaurus or crossword app to finish the little letter boxes that it's sort of cheating. But oh no. In the face of last week's Cryptic, I am an epsilon semi-moron. ​Hopefully soon, I'll get over my hybernia.